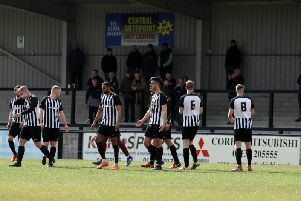 Any question marks over Corby Town’s character and commitment were answered in dramatic fashion last weekend. The Steelmen were up against it throughout their Evo-Stik League South Division One Central clash at Sutton Coldfield Town. They trailed 2-0, 3-1 and 4-2 but still found a way back as Elliot Sandy’s second goal of the game arrived in stoppage-time to secure a 4-4 draw. The stalemate left Corby five points behind leaders Peterborough Sports while Bromsgrove Sporting leapfrogged them into second place. But boss Steve Kinniburgh was pleased to see his team’s battling qualities on full show. And he believes that “hunger and desire” is now well and truly installed into his squad. “To be honest, since I have been doing the job it is one thing that has been installed,” he said. “It was something I wanted to put into the young squad we had here last season and it has been carried on into this group to keep going until the last minute. “It is a trait that has been well instilled into the players. And it’s an attribute that is important to hold on to once it is there. “It’s not just something that can be used to win games either. “We showed last weekend that you have to keep going. We were losing the game and we stayed in it and got a point from a losing position right at the death. Sandy’s brace during the draw at Sutton Coldfield took him to 20 goals for the season in all competitions while Jordan Francis and Tolani Omotola were also on target.